Welcome to Orchestra North East! Missed our Russian Gala concert? Read a review in The Northern Review here. 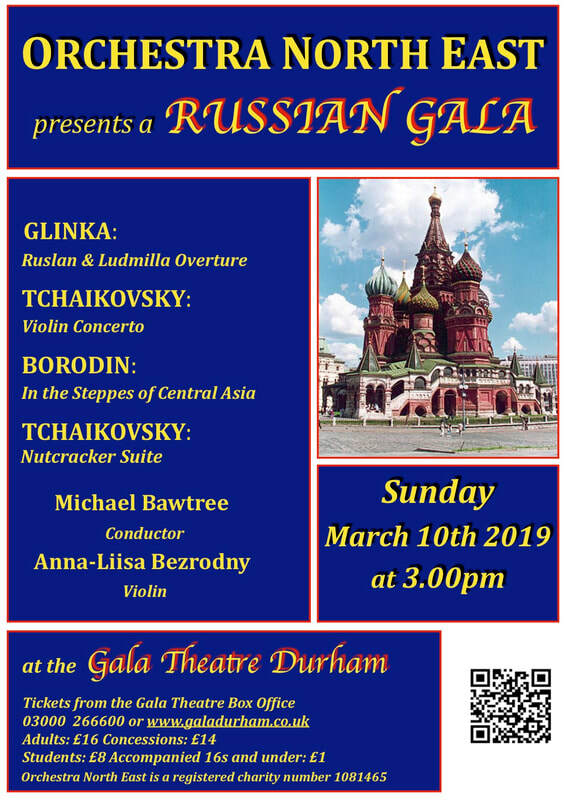 ​For the second concert of the 2018-2019 season we are returning to the comfortable surroundings of the Gala Theatre, on a Sunday afternoon, a format that we know has proved particularly attractive. With a popular all-Russian programme, we’ve given it a title – a Russian Gala – and we hope it will show off some of the contrasts and styles of that distinctive school of music. We are very pleased to welcome back Russian-born Anna-Liisa Bezrodny to play the Tchaikovsky concerto with us. From a family of distinguished violinists, Anna-Liisa is one of the leading soloists of her generation and regular audience members will know that this will be her third appearance with the Orchestra. We are eagerly awaiting what we know will be a stunning performance of one of the great works of the violin repertoire. A lively opening to the Russian Gala will be provided by Glinka’s sparkling overture to his opera Ruslan and Ludmilla. In gentle contrast, Borodin’s evocative tone poem, In the Steppes of Central Asia, paints a tuneful picture of the vast expanses of Russia. Tchaikovsky’s famous score for the ballet The Nutcracker will need little introduction. The suite of dances is one of the most famous collections in all classical music, although their familiarity does not lessen their challenge for an orchestra. Our conductor, Michael Bawtree, from the Royal Conservatoire of Scotland, has extensive experience in this musical field and we are very much looking forward to working with him in exploring this beautiful music. With soloist Anna-Liisa Bezrodny (violin) and conductor Michael Bawtree. Anna-Liisa Bezrodny will perform the Tchaikovsky Violin Concerto in our March concert. Do you love Orchestra North East too? Here's an interview with Peter Chester, a long standing committee member talking about the orchestra. How you can help? Orchestra North East has been playing and performing fine classical music in the north east for 30 years. We were originally Durham Sinfonia, set up in 1986. We changed our name to reflect the large scale orchestral works we now perform, and the range and calibre of musicians we attract from across the north east region and beyond. Take a look at our archive of past concerts to see the works we've undertaken over the past three decades! We hire professional conductors, soloists and leaders - see what they think about working with Orchestra North East. Many of the conductors trained at the Royal Northern College of Music and have international reputations: André de Ridder, Philippe Bach, and Baldur Brönnimann. Others bring to our orchestra their experience of performance with major UK orchestras and concert venues – Thomas Blunt, Timothy Henty, Aidan Oliver, Neil Thompson, Jamie Burton, Ben Zander. Orchestra North East celebrated our 30th Anniversary in 2016. 2016 was a very special year for Orchestra North East – we had something to celebrate with music-lovers across the region. In 1986 Orchestra North East, then known as Durham Sinfonia, gave its first independent concert in Durham Cathedral. The Orchestra had been created some fifteen years earlier and had strong links with Durham University and its Choral Society, but in 1986 it began a new self-sustaining phase, as a charity, and has performed every year in the Cathedral since that time. In the thirty years, 1986-2016, the Orchestra has given over 120 concerts, performing the works of over 80 composers; we’ve had 33 conductors, 48 soloists and most importantly we believe over 25,000 people will have attended our concerts, something of which we are rather proud. We are also pleased to have spread our wings to perform in other venues over the years, particularly to have played it the Sage Gateshead and to give regular concerts in the Gala Theatre Durham. We celebrated our 30 years with a concert at Durham Cathedral on October 8th 2016 where the stage was set for a wonderful evening, which brought together established friends of the Orchestra, as well as providing an evening of glorious music. To mark the anniversary we opened the concert with a world première performance of The Land of the Prince Bishops, by North East composer Robert Smedley. Filmic in quality, this nonetheless symphonic piece comes from his suite Dunelmia and is inspired by his love of County Durham. The music seeks to depict elements and scenes from the region and its history, leading the audience to both visualize and identify with our part of the world. Our distinguished soloist for the evening, cellist Alexander Baillie, has previously given numerous memorable performances with us over the years and we were delighted that he was able to return once more to perform Elgar’s Cello Concerto. This gloriously nostalgic piece of music was perfectly suited to the sonorities of the Cathedral. We also enjoyed playing Bruckner’s Fourth Symphony, known as “The Romantic”. Bruckner’s orchestral music has an epic quality and he always uses the full forces of the Orchestra to dramatic effect, something that was most suited to the venue. The concert was conducted by the rising young British conductor, Timothy Henty. Timothy has given several successful concerts with us now and it is very gratifying that such talented professionals continue to return to work with us. And finally - Orchestra North East is delighted and proud that in 2015, distinguished conductor John Wilson accepted our invitation to become the Orchestra’s Honorary President.